The Firefox logo is to be displayed in its entirety on either a solid light or dark background (avoid mid-tone or strongly colored backgrounds). Note that the shadow is part of the logo and should not be excluded. The logo must include the trademark (TM) symbol. The logo should not be displayed on screen at any smaller than 24px tall (with the exception of system icons that demand smaller sizes). The logo should not be displayed in print at any smaller than 3/8" tall. The Firefox logo may be displayed on its own without the accompanying “Mozilla Firefox” text. When displayed with the accompanying “Mozilla Firefox” text, it must be displayed in one of the following two arrangements. 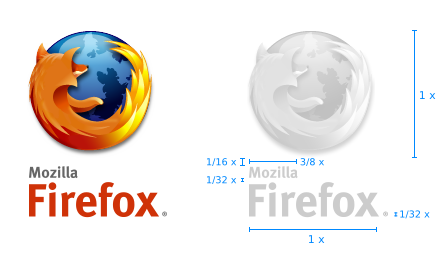 When displayed with the Firefox logo, the product name “Mozilla Firefox” should be rendered in the MetaBoldLF-Roman font in the appropriate size in relation to the logo as indicated in the figures above. The wordmark must include the registered trademark (®) symbol. 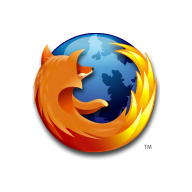 “Mozilla” text and registered trademark (®) symbol must be rendered in the hex color #666666 (RGB: 102, 102, 102). “Firefox” text must be rendered in the hex color #D64203 (RGB: 214, 66, 3). The should not be displayed on screen with the logo portion at a size any smaller than 24px tall. The logo should not be displayed in print with the logo portion at a size any smaller than 3/8" tall. 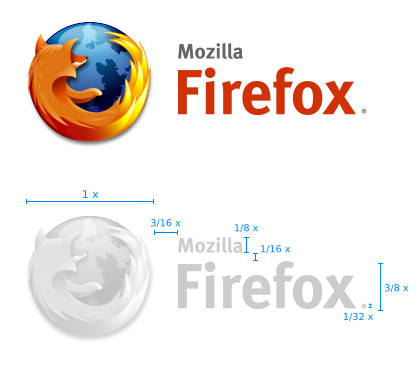 The Firefox logo and wordmark should not be displayed in modified or displayed in ways that visually compromise the logo. The following figures highlight some common mistakes to avoid when displaying the logo and wordmark.